The York Museum Gardens are a botanic gardens in the centre of York, England, beside the River Ouse. They cover an area of 10 acres of the former grounds of St Mary's Abbey. One day, the boyfriend and I decided to go on a random road trip to York and we ended up at the York Museum Gardens. The weather was slightly warm, but still quite cold so we went for a walk in the gardens. The museum gardens are lovely and seemed like a nice place to chill out, maybe have a picnic (on a good sunny day). The above picture is a photograph of a hall located at the gardens that can be used for events i.e. weddings, party reception etc.. While I was there, I took some pictures that I would like to share with you.. Photos of the garden's architecture and pictures of around the garden. I even got to see a cute owl. This was actually my first time of seeing an owl in person and it was good to see one. After some strolls around the gardens, the weather started becoming really cold (good ole British weather!) So, the boyfriend and I popped to the nearest Costa for a hot chocolate for me and a Mocha for him. After that, we made our way back home as by that time it was already getting dark and we had a long drive back home. It was a shame that we couldn't really have a proper day out in York as we arrived at a slightly later time and the weather wasn't really that great on the day. But, hopefully we will return to York again to explore more of York and what it has to offer. The following are a couple of pictures I took of the gardens, I hope you like them. That's all peeps! Have you been to York?.. If you have, where did you visit while you were there?.. I would love to know. Have you ever been to the York Museum Gardens? Would it be somewhere you would like to visit?.. I recommend a visit if you ever get a chance. Also, The above picture is the owl I got to see.. A cute little fella! I was thinking, maybe I should have given him or her a name (can't remember if the owl was female or male) Oh well, never mind hey.. If you're anything like me, I'm sure you'll love that perfect comfy wear to change into when you get back home from work, an outing, a date night, wedding etc.. Or even just to lounge about at home. You can't beat the feeling of changing into comfy lounge wear or pyjamas and getting proper comfortable and cosy. I mean who doesn't like getting out of work wear, outing wear etc.. Taking your makeup off and just getting into that complete chill out mode. Today, I would like to share with you some lounge wear inspiration. I was browsing through my favourite ASOS and picked out a few of my favs to share with you.. I hope you like them! This outfit looks super comfy for just chilling out at home plus I like the colour grey!.. Although, I think this outfit is more for chilling out at home, you could possibly pop out to nearby shops too wearing this outfit. It's more of a grey jumper and joggers kinda outfit. This could be worn with a T-shirt underneath the jumper. This outfit is from ASOS. The jumper is called South Beach Grey Jumper for £20.00 and the joggers are called South Beach Grey Jogging Bottom for £18.00. This soft-touch sweat, off-shoulder bardot neckline jumper is similar to the South Beach Grey. The jumper is off the shoulder as already mentioned and the joggers are the same style as the South Beach Grey joggers. This outfit can also be worn casually in the home just lounging about. The Jumper is also from ASOS and called South Beach Off Shoulder Sweat for £18.00, the joggers are called South Beach Ecru Jogging Bottom for £18.00 and the colour is Ecru. I haven't really actually worn a jumper or top that is that off the shoulder as a slim girl, but I do like it and you never know I might give it a try and it might even suit me, haha.. This is another jumper/slimmer fitted joggers/sweatpants type combo. The joggers look a lot more slim fitting than the others but look alright and something I would at least try on to see how it fits. I like the navy colour, but the colour is actually listed as navy/grey. The jumper is described as a soft-touch bonded knit with a round neck, with the sweatpants described as soft-touch fluffy knit with a stretch waistband. The jumper is available from ASOS, it's called Micha Lounge Double Face Bonded Jumper for £38.00 and the sweatpants, also available from ASOS, are called Micha Lounge Carrot Sweat Joggers for £39.00. 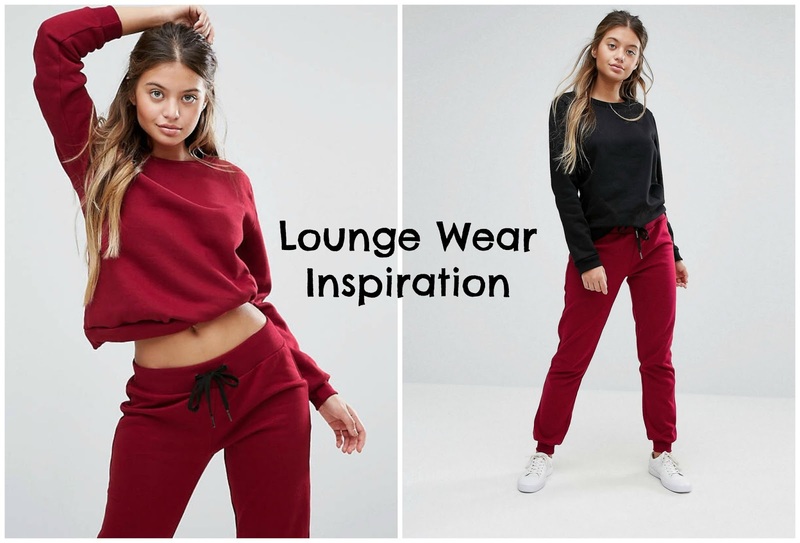 This lounge wear is more of a cardigan/hoodie & slim fitting joggers combo. The material is described as soft-touch knit. If you are looking for comfort and style, this outfit looks proper comfy with elements of style to it. This cardigan can be layered up with a t-shirt underneath, wearing it with the joggers for night-in legit lounging. This outfit is also available from ASOS the cardigan is called Micha Lounge Grey Hoodie With Contrast Tipping for £38.00 and the bottom's called Micha Lounge Knit Jogging Bottom With Contrast for £39.00, colour: Light grey/cream. This lounge set is really cute! I like the star pattern and the light grey colour. This looks a lot more like a pyjamas set. So, unlike some of the ones, I'd probably stick to wearing this just at home and definitely not wearing it out of the house lol. 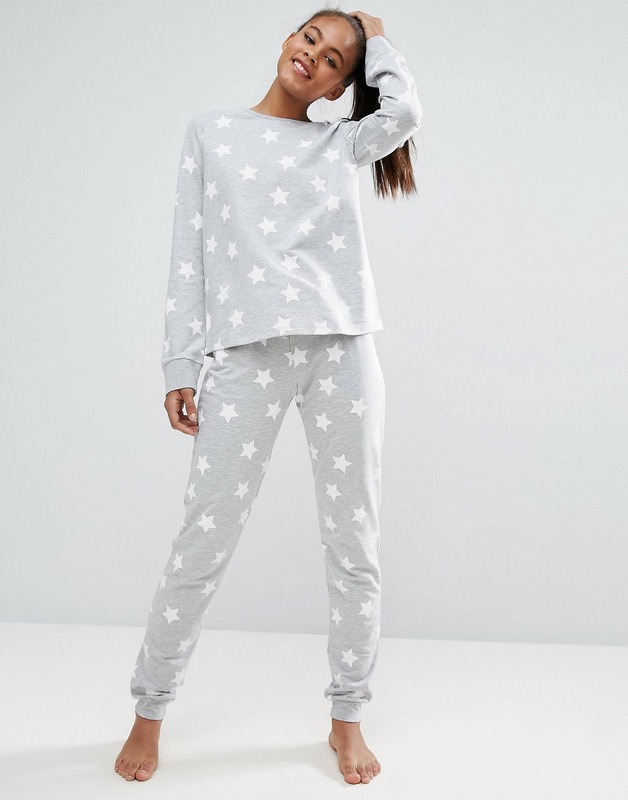 As name of the lounge wear has already given away where its from (haha), the set is from ASOS called ASOS Lounge Star Sweatshirt for £18.00 and the bottoms, ASOS lounge Star Jogger for £20.00. The last one on my list is this casual lounge wear that can actually be worn outside as well as for lounging in the home. I like the pink cropped sweatshirt paired with the grey joggers. As styled, I also like that you can layer/pair the cropped sweatshirt with a vest top or t-shirt or you could just wear it on its own. I like that the grey joggers also look quite slim fitted. The cropped sweatshirt and joggers are available from ASOS like the others mentioned. It's called Only Play Pink Cropped Sweatshirt for £25.00 and the joggers called Only Play Grey Melange Joggers for £28.00. That's it peeps! That's my list of lounge wear inspirations. ASOS is such a good retail outlet that has a wide variety of outfits I could browse through it all day!.. What do you think of my selections? Please feel free to leave me a comment below, letting me know what your thoughts are.. Till next time!.. Here we go, my first attempt at writing a personal post.. So, I am sure you'll all agree that being an adult comes with great responsibilities and can also be tough and challenging most times. Once you get to the point of moving out of home and becoming independent, that's when I think real adulthood starts. Adulthood isn't all it seems - Although there are advantages to being an adult, there are also disadvantages like most other things. Enjoy your carefree childhood - You only get to be a child once so enjoy it!.. Treasure the moments (You don't really think much about this as a child) - Advice to others where applicable, try and appreciate things and not take them for granted. Don't be in such a hurry to move out of your family home - You may think that once you turn to a certain age, you are ready to move out.. For me, moving out when I did was down to my circumstances at the time, so it's okay. My advice to others is to stay at home until you are able to save a decent amount of money before you move out. However, I do understand that people's circumstances are different so this may or may not be an option etc.. 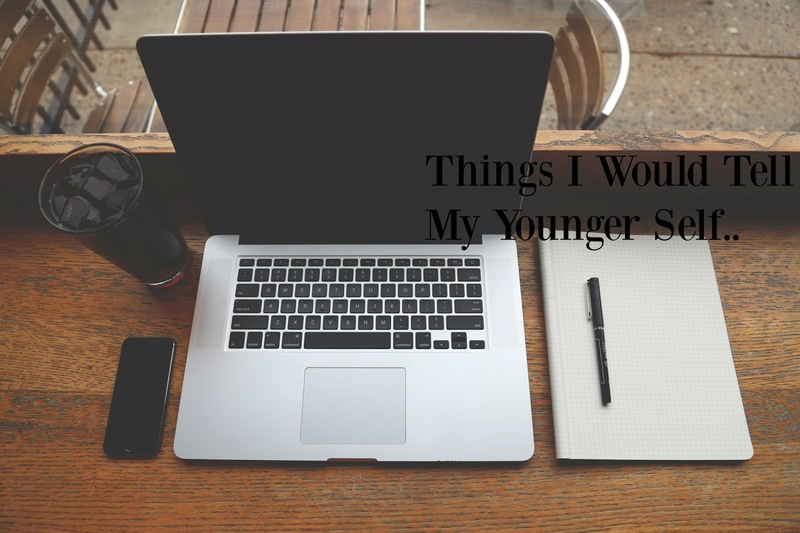 These are a few things that I would say if I could.. Life is too short and as an adult, you can get so caught up in everything and the world of adulthood that you forget to actually enjoy your life. Life is definitely an experience and when I start having my kids, I will try and share some of my experiences with them..
Do you miss your childhood?.. A care-free life with no worries, just hanging out with family and friends having a laugh and having fun. When you reach a certain age, all you'll probably worry about trivial things like boys or maybe what outfit to wear to a party etc.. Although, as an adult I still have the 'what to wear' moment and I'm sure this is probably the same for everyone (kinda) 😊. If I could go back to being a child for a day or so right now, I will definitely jump at the chance, would you? What would you tell your younger self?.. Is there anything you might have taken for granted that you wished you didn't?.. Feel free to let me know in the comments below if you wish too. I love to hear your thoughts. Till next time!.. I hope you all had a good one! So, here is the first post of the New Year 2017! At the start of a new year some people see this as a new start, a way of starting afresh.. Some people make new year resolutions, some make new year goals. For me it all depends.. It could be one or the other or a bit of both. This year, I have few goals, Blog Goals, Youtube, My Twitter Chat, my Social Media online presence in general etc.. And also some personal goals. This year, for my blog I would like to be a bit more consistent with my posts, engage and interact more with you all. I also hope that at the end of the year, I would have been able to see some growth. The same as my blog, I started, but life got in the way and I wasn't able to commit to recording and uploading videos for my channel. So this year, things are hopefully going to change and I am hoping to revive my channel. I am really looking forward to recording variety of videos for you all. I hope you guys will stay tuned for that! You better get subscribing so you can get an alert for when I upload a video. Currently, I don't spend as much time online as I would want to. 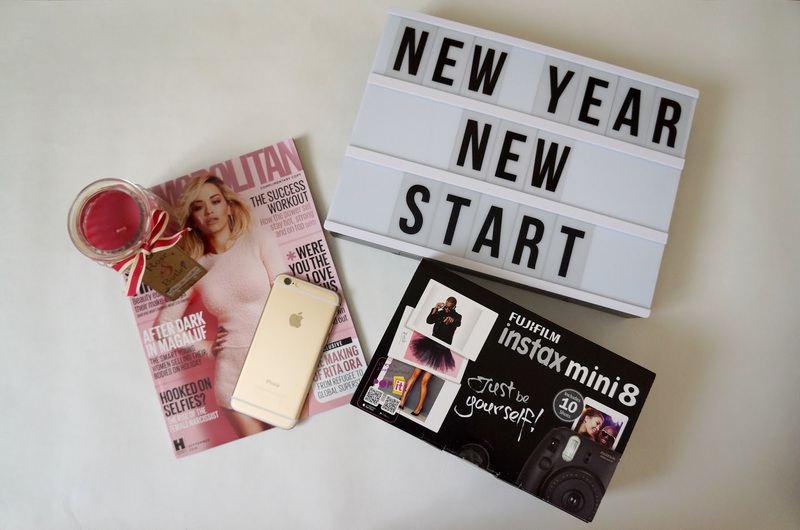 This year, I want to be a lot more active online engaging and interacting with more bloggers. One thing I do though, is join quite a few twitter chats online which is really helpful and fun. There are a few chats on twitter that I came across last year. I didn't even know they existed but I'm glad I found them. I hosted a chat once and I really enjoyed it. It inspired me to start my own and that's when I created Gossip Bloggers. Those are some of my goals hopefully I will be able to achieve them. Do you have any goals for the year or any new year resolutions? Feel free to share some in the comments below if you want to, I would love to hear what your goals/resolutions are. I wish you all the best in achieving your goals for 2017 Good Luck!.. © Fashion, Style, Life & Gossip | All rights reserved.